Stop losing momentum with reply-to-all wars and buried emails. Hip Chat gives you group chat, 1-to-1 messaging, file sharing, and powerful integrations with your favorite tools. With Hip Chat, you can quickly connect directly with the person you need, regardless of where they are. Enterprise chat provides real-time communication, and with Hip Chat, you can chat seamlessly from desktop and mobile. Hip Chat integrations feeds you information from third-party tools that you use every day. You won’t miss a beat, and you won’t have to juggle a bunch of other apps to monitor your business or your project. Integrations put updates and info right into Hip Chat from Atlassian products like JIRA, Bitbucket, and Confluence as well as from third-party services like Asana, Google Drive & Calendar, Trello, Twitter, Zendesk, and more. Time travel: just kidding–but having a fully searchable chat history is sort of like time travel. We use Hip Chat, not just for our work, but to foster the spirit of a great tech culture. Face-to-face communication is ideal, but not always possible for us. Instead we rely on Hip Chat. Hip Chat keeps everyone up-to-date and accountable. 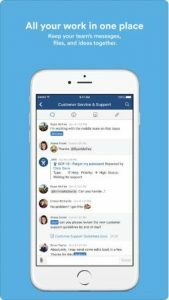 Hip Chat is brought to you by Atlassian, makers of the popular Confluence collaboration tool; ticketing and workflow tools JIRA Software, JIRA Service Desk, JIRA Core; and developer tools like Bitbucket, SourceTree, and Bamboo.